Question answering fun in a board game. It’s hard to believe that the cue ball with mystical powers has been around for more than a half a century. That’s right, the Magic 8 Ball is celebrating its 55th anniversary in an entire new format with the ridiculously unpredictable Magic 8 Ball Board Game, which combines the question answering fun of the original Magic 8 Ball with the excitement of a board game. 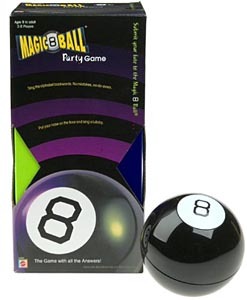 The Magic 8 Ball Board Game features include four categories of 88 Fortune/Fate question cards with challenges of physical, mental, sequence and Crazy fun, and a Magic 8 Ball that doubles as a timer. The mind-numbing hilarity will have players rolling on the floor, literally. Players will want to hold onto their tokens because the Great Eight Potentate in round two dictates the price players must pay to win back lost tokens. Players win by being the first to earn back all of their tokens.